I saw this earlier on Facebook and it made me feel more than a little petty. 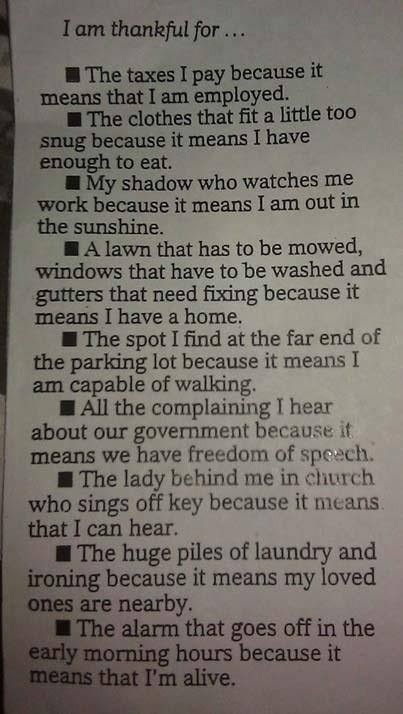 I’ve been doing more than my fair share of complaining lately so here’s my Thankful list! I’m thankful for my family! Too many people will spend the holidays all alone. I’m thankful for being stuck in traffic! A lot of people don’t have cars & they have to walk or wait in the cold for public transportation. I’m thankful for long lines in the stores. It means our economy is doing better! And I’m thankful we’re not at war and rationing. I’m thankful sometimes the shelf is empty. I can save the money I would have spent on something I can probably live without. I’m thankful for angry people! One more chance to share God’s love with someone! I’m thankful for fussy children. Each child is a gift AND a miracle! I’m thankful for the cold weather! It’s really fun to snuggle up with hot cocoa under a fuzzy blanket! I’m thankful that I am able to appreciate all of the good in the world. Isn’t it funny how sometimes we miss the good and we can only truly appreciate it by seeing the bad? And I’m thankful for anyone who reads my blog…the good and the bad! I’m thankful for my wonderful family, too. We need to stop taking our families for granted and enjoy every minute we have with them.